Firstly, the sad news. Our little lorrikeet, Laina, died on Saturday. She got caught playing with one of her rope toys and even though physically she appeared to be ok, she must have been too stressed and so didn't make it. She was such a lovely little bird - was saying 'Hello Cocky'. Greeted me every morning. She was like a kitten when she played - rolled over and kicked her legs in the air, hung on to ropes, etc. Such a little character. Lots of tears as a result. Second son was in the High School's Rock Eisteddfod and that was on last Friday night. Wonderful night. 10 schools took part - from both Primary and Secondary. Each performance was so good. I took lots of photos at the last dress rehearsal, so will upload those soon. Thought I had them on the computer today, but downloading didn't work. Jazz and tap exams are over for another year. That was two days last week. We have to travel to another town about an hour away to participate as our dance studio is too small to be independent. I have finished a quilt! Yeh!! Been working on it for a little while now. Using various embroidery stitches on my machine. it's been a fun project - but lots of mistakes. A learning experience I think I'll call it. I have a brightly coloured warm quilt, so it's still an ok result. I'd like to try it again - using what I have learnt this time. Maybe - so much on the list now! Once again, haven't got the photo of the quilt yet. Will try to get organised tomorrow. I've started working on cup cake embroideries for my daughter. She wants to make a scrap quilt featuring machine embroidered cup cakes. Using bright colours. I've started organising the embroideries for her. Next week I have a class making an appliqued chenille cushion cover. 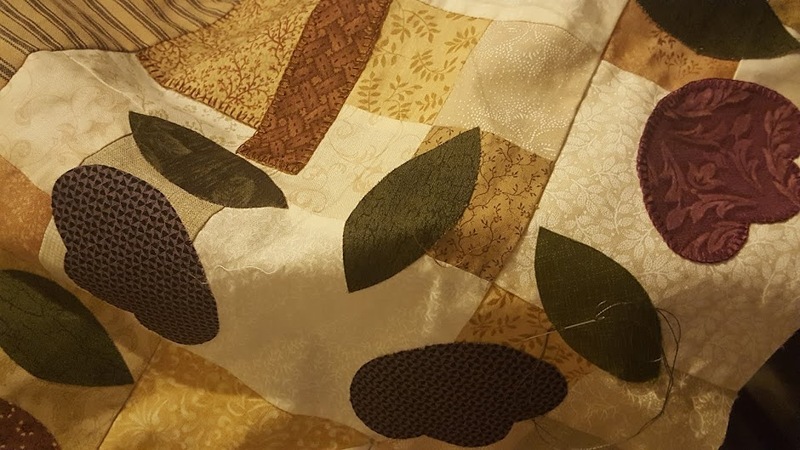 I've made a chenille quilt in the past, but not one with applique. I'm looking forward to the class. I've also started working on embroideries for another quilt I'll be making in class in about two weeks time. It's using the Create a tilt ruler from Sewing Revolution. It will be a lap quilt. Should be lots of fun. So, until tomorrow and some photos. Take care. Sounds like there has been heaps going on. I'm so sorry to hear about your sweet little Liana. Very sad indeed. I'm so sorry to hear about little Laina, it's so hard to lose a pet! Can't wait to see your quilt!